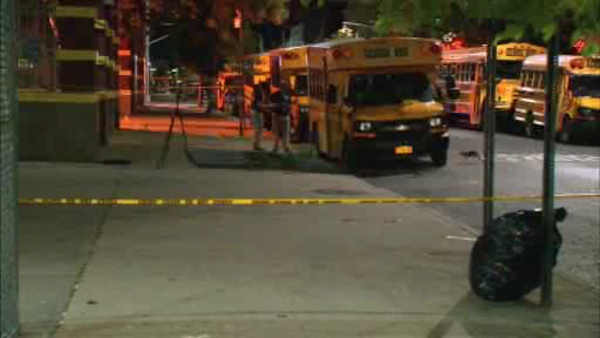 FLATBUSH, Brooklyn (WABC) -- A 16 year-old is in custody, believed to be the suspect in the murder of a father who was killed over his son's stolen sports team ball cap outside a Brooklyn school. The teen was arrested by the Regional Fugitive Task Force. He will be questioned at an NYPD precinct, and charges are expected. The father, 38-year-old Gerald Cummings, was killed earlier this month in Flatbush. Police said he had confronted a teen who stole his son's pricey Oakland Raiders cap outside PS 6 on Snyder Avenue. The father grabbed the hat back, but as he walked away with his son, police said they were followed by the thief and two of his friends, one of whom pulled a gun and started firing.